ClorDiSys provides biodecontamination services for routine or single-time events and specializes in contamination prevention and response for new and existing facilities. Our chlorine dioxide gas fumigation technology allows for the complete decontamination of your facility all at once, with minimal equipment and minimal downtime. Our gaseous systems provide the ability to achieve complete distribution and a thorough penetration of chlorine dioxide gas to each and every surface within your facility, including microscopic cracks and crevices to deliver an extremely high level of biodecontamination, something other agents such as vapors, mists, and fogs cannot promise. Our chlorine dioxide is safe on materials and leaves no post treatment residuals. Browse the industries to the left to learn more about all the applications in which chlorine dioxide can provide solutions. For a true gas such as chlorine dioxide, its small molecular size, approximately 0.124 nm, and a natural ability to fill any space it is injected into evenly and completely offers an unmatched distribution ability. In addition to complete distribution, the steriliant must be able to penetrate into all areas. Chlorine dioxide gas is a selective and highly effective oxidizer making it easy to penetrate surfaces, microscopic cracks and crevices and even through organic matter. 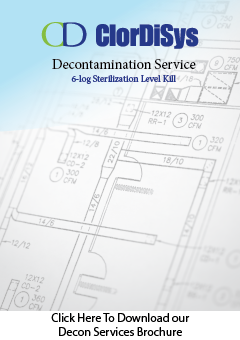 Once your sterilizing agent has distributed and penetrated into all areas, it must remain there long enough to provide the desired level of kill. Chlorine dioxide is a colored gas and its concentration can be accurately measured and monitored in real-time allowing for tight control of important decontamination process parameters. True gases are the only agents effective in hard to reach areas such as HVAC systems, cracks and crevices, and inside equipment due to their small molecular size and mobility.